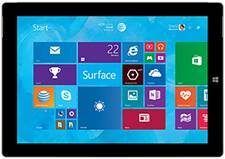 The Microsoft Surface 3 Tablet is a smaller and lighter version of Microsoft’s flagship Surface Pro 3, with a 10.8 inch screen instead of 12.0 inches for the Pro. What is particularly interesting about the Surface 3 is that its display performance is almost identical to the excellent Surface Pro 3 display, including a full sRGB Color Gamut. But in addition, it has a bonus – the Surface 3 is the first display that has a Color Gamut optimized for typical 300 lux indoor ambient light levels instead of for the dark, like all other current displays. It provides the best absolute color accuracy on a display for real-world indoor ambient lighting levels of 300 lux, an important performance feature that no other display currently provides. Microsoft provided DisplayMate Technologies with a production unit of the Surface 3 so that we could perform our well known objective and comprehensive display Lab tests, measurements, and analysis, explaining the in-depth display performance results for consumers, reviewers, and journalists. Any ambient light reflected off the screen will wash out the images seen on the display, resulting in reduced image contrast, color saturation, and color accuracy. So, in principle, the display should have an appropriately higher color saturation and larger Color Gamut in order to counterbalance and compensate for the loss of color saturation in ambient light. And that is exactly what happens on the Surface 3. Its native Color Gamut triangle is appropriately enlarged so that the on-screen Color Gamut at 300 lux results in an almost perfect sRGB/Rec.709 Standard Color Gamut, which is shown in Figure 1. We remeasured the Absolute Color Accuracy in 300 lux ambient light, which is shown in Figure 2c. It is a very impressive 1.7 JNCD, more accurate than at 0 lux, and more accurate than any other display that we have ever measured in real world ambient lighting conditions at 300 lux. See this Figure for an explanation and visual definition of JNCD and the Color Accuracy Figures showing the measured Color Errors. See the Color Accuracy section, the Color Gamut and the Color Accuracy Figures for measurements and details. The Intensity Scale (sometimes called the Gray Scale) not only controls the contrast within all displayed images but it also controls how the Red, Green and Blue primary colors mix to produce all of the on-screen colors. So if the Intensity Scale doesn't follow the Standard that is used to produce virtually all consumer content then the colors and intensities will be wrong everywhere in all images. Unfortunately, many manufacturers are quite sloppy with the Intensity Scale on their displays because it must be logarithmic. Fortunately, the Intensity Scale on Surface 3 is very accurate and a close match to the sRGB/Rec.709 Standard, although it becomes less steep with lower image contrast at the very dark end for signal levels below 25 percent. See Figure 3 for a plot of the measured Intensity Scale and the Colors and Intensities section for measurements and details. Based on our extensive Lab tests and measurements on the display for the Surface 3, Microsoft has produced an excellent high performance display for Windows. In fact, the Surface 3 has one of the very best and most accurate displays available on any mobile platform and OS. It joins near the top of a small set of Tablets that have excellent top tier displays – ideal for both professionals that need a very accurate high performance display for their work, and for consumers that want and appreciate a really nice and beautiful display. our iPad Air 2 Display Technology Shoot-Out and our OLED Tablet Display Technology Shoot-Out articles. For comparisons with the other leading Tablet, Smartphone and Smart Watch displays see our Mobile Display Technology Shoot-Out series. and 16:9 for widescreen video content. are 16 inches or more. Typical Viewing Distances are 16 inches or more. The Surface 3 does not have this issue. See Screen Reflections, Brightness and Contrast, Colors and Intensities, Viewing Angles, LCD Spectra, Display Power. All LCDs show a large Brightness shift with angle. in the Lab Tests and Measurements. Tablets are seldom used in the dark. displays available on any mobile platform and OS. ever measured for a Tablet is 2.5 percent. The Lowest Brightness with the Slider set to Minimum. This is useful for working in very dark environments. in a 300 lux ambient light level. degradations at less than ±30 degrees, which is not an atypical Viewing Angle for Tablets and Smartphones. significantly based on how the Tablet is held. The Viewing Angle can be very large if resting on a table or desk. same screen brightness (Luminance) and same screen area in order to compare their Relative Power Efficiency. The Surface 3 has display power efficiency comparable to the Surface Pro 3, but considerably better than the iPad Air 2.
is entirely at Peak White for Maximum Brightness. same screen area as the Surface 3. DisplayMate Technologies specializes in proprietary advanced scientific display calibration and mathematical display optimization to deliver unsurpassed objective performance, picture quality and accuracy for all types of displays including video and computer monitors, projectors, HDTVs, mobile displays such as Smartphones and Tablets, and all display technologies including LCD, OLED, 3D, LED, LCoS, Plasma, DLP and CRT. This article is a lite version of our intensive scientific analysis of Smartphone and Tablet mobile displays – before the benefits of our advanced mathematical DisplayMate Display Optimization Technology, which can correct or improve many of the display deficiencies. We offer DisplayMate display calibration software for consumers and advanced DisplayMate display diagnostic and calibration software for technicians and test labs.